Hiroshige Museum of Art, Ena. <Tokaido Gojusan-tsugi Nouchi> is a large complete woodblock print commonly known by its publisher's name, "Hoeido Edition". With the successful completion of this work, Utagawa Hiroshige established his name as a landscape painter. People are coming and going busily against the dawn sky in the background dyed by madder red. Nihonbashi, the start of the 50 roads, prospered as key point in Edo. In the painting we can see a fishmonger carrying tub as well as a greengrocer. On the left side of the painting where the bulletin board on the west side of the Nihonbashi Minamizume is, there are notices handed down from the shogunate posted. 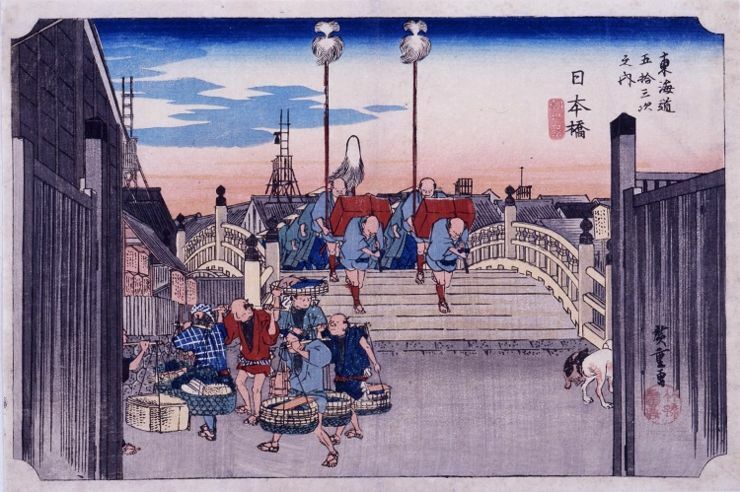 On the bridge there is the daimyo's procession travelling in front carrying boxes with gold crests and decorative spears. With the scene of a lively Nihonbashi early in the morning depicted, it is a painting which is perfect for the start of a journey. Copyright (C) 2001 - 2019 All Rights Reserved by Hiroshige Museum of Art, Ena.